Dreams, hopes and aspirations can get crushed, but they never really go away! The divine spirit of peace and justice is unquenchable. A marvelous example of this reality is preserved in the place where people would least look for it, in the book of Revelation and in ancient Anatolia (today’s Turkey). When in year 133 BCE the last king of Pergamon Atallus III bequeathed his kingdom to the Romans, a local man named Aristonicus claimed the throne and initiated an uprising of the surrounding population. Instead of being subjugated to the expanding Roman Empire as expendable serfs, Aristonicus promised to his follower citizenship in Heliopolis (city/state of Sun). His movement attracted large following especially among peasant and urban poor in broader western and central Anatolia (modern day Turkey). But before they progressed in making their dreams reality, their experiment was crushed by Roman legions. Aristonicus was captured, paraded in Rome and executed by Roman Consul in 130 BCE. 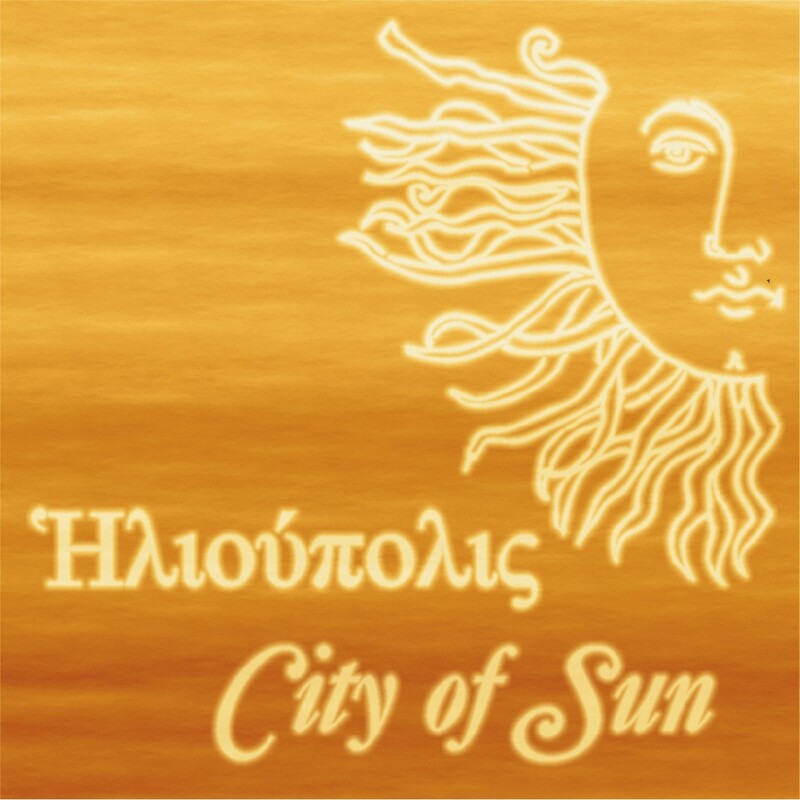 It might appear that the dream of the Sun City was extinguished and completely forgotten. But two hundred years later it appeared again in the very same geographic area. Again it was associated with the Roman persecution of a social and religious movement, this time Christian. A dream of Heliopolis appeared again in a vision of the New Jerusalem basking in the direct and never-ending sunshine of the divine (there will be no night there). The Revelation is probably the least understood of all the biblical writings. Fundamentalists of all different stripes take it literally and abuse it to instill fear. That is the very opposite of its original intention. The message intended to bring encouragement in the middle of persecution and an invitation to dream about an alternative, better, more harmonious sunshine divine world. When people forget to dream, it is the most tragic thing that can happen. When they take the gray drudgery and often abusive reality of their everyday lives as the only possible and imaginable reality and option it is the saddest sight. The last two chapters of the Book of Revelation inspire and invite to dream. Come this Sunday to dream the Sun City dreams. How would you feel if someone called you a pest or garden weed? I would certainly feel offended, put down, denigrated. But such name calling might be more sinister than just that. These labels can also indicate serious threat. Totalitarian regimes are known for using these kinds of expressions and metaphors to single out individuals and groups of people they do not like and consider enemies. These kinds of horrid farming metaphors have facilitated and justified ostracism, persecution, and even genocide, just remember the Nazi or the Balkan ethnic cleansing and its vocabulary of weeding out those they considered heterogeneous. We can also consider the very local Committee on Un-American Activities, somehow milder but with quite strange aftertaste! But wait a moment. Pest and weed are considered abusive labels only because we all have accepted and internalized a narrow and self-serving perspective of farmers. Ask pre-agricultural hunter gatherers about pests and weeds and they would not know what we are talking about. Ask modern biologists and environmental scientists about the weeds and pests and they will be in seven heaven. They like least of all monocultures - those miles upon miles of identical (often genetically modified!) crops of industrialized farming. Our agro-industry became so effective in suppressing all the pests and weeds that it threatens to exterminate them all while simultaneously polluting water, soil, air, and even the very food it produces. It seriously compromises biodiversity of our countryside and harms our environment and subsequently all of us. For biologists and environmentalists pests and weeds are not swear words, but sweet words. They are positive signs of nature fighting back, trying to preserve and expand natural biodiversity. This importance, beauty and deep significance of biodiversity is only slowly being discovered and appreciated by modern science. Thousands of years ago Jesus pointed it out to his disciples and followers. This Earth Day Sunday we will uncover and celebrate the deep and conjoined roots of social and eco-justice and celebrate a (bio)diversity festival. In Sunday sermons, and even greater depth in our Sunday morning bible classes, we have been engaging in cutting edge biblical theology. In the field of New Testament scholarship it has been called the Third Quest for the Historical Jesus. In the last decade or so biblical scholarship has substantially changed our understanding of Jesus and his time. It is an exiting time, because this scholarship supports the social stands of our congregation and can further integrate social justice advocacy with most recent theological scholarship. Even a common image of Jesus on a fishing boat can suddenly convey a quite radical social message. Do you know that there was a naval battle in ancient Galilee between Jews and Romans? Josphus Flavious reports this event in his book De bello Judaico (Jewish War III.10 [497-515]). He describes how in the year 67 C.E. the Romans captured the fortified city of Tarichess (also known as Magdala). He relates how some of the Jewish resistance fighters escaped in boats on the Galilean lake and how the Romans chased them down the next day and defeated them in the first but last known Galilean naval battle. Josphus attributes the Roman victory to their superior ships, while the boats of the Jewish resistant fighters were, according to him, good only for piracy. This mention of piracy could be considered just a standard schematic denunciation of any sea-born opposition. One can hardly envision any true piracy on a lake, because you can easily see from shore to shore. On the other hand this inadvertent remark could be quite close to reality and interestingly illuminate Jesus’ life and ministry. In year 1986, two brothers - Moshe and Yuval Lufan - discovered the remains of an ancient boat in the Galilean lake near modern Migdal (ancient Magdala). The boat rested in shallow water and had been covered and preserved by mud since the first century C.E. It was retrieved and painstakingly reconstructed and now is on display in the museum of Kibbutz Ginossar. The boat was about 27 feet long and 7.5 feet wide. It carried five crew members, in addition, it could carry about a ton of cargo or ten passengers. The boat's bottom was nearly flat, permitting it to be used close to the shore. It could also easily land and be pulled out of water on shore - all properties sought after by fishermen and pirates alike, giving them opportunity to embark and disembark, to appear and disappear almost anywhere along the shore. One more detail was interesting: the boat was patched together from fourteen different kinds of wood and most of it was reused - salvaged from other older boats. Evidently in the first century even the ship owners lived under severe economic pressure. Now think about Jesus. He called fishermen as his disciples, preaching from their boats moored by the shore, appearing in villages and towns around the lake, embarking and disembarking along the shore, often on the deserted places. You cannot avoid thinking he was escaping across the lake, crisscrossing the lake often by night. I am not implying he was a leader of any true pirates who robbed other impoverished fishermen and struggling merchants. Jesus was someone much more glorious and dangerous at the same time. He was a preacher and healer with a message of the kingdom of God, with an incendiary message of a new order built on abundance found in sharing, plentiful divine grace, stigma lifting healing, peace and the justice of God. He was reconnecting impoverished, dispossessed, alienated people, offering them acceptance, restoring their self esteem and their integrity and bringing them hope. The economically stressed and disenfranchised fishermen recognized this otherworldly grace. They allowed him in their boats, they let him preach from their boats, they offered him the skills and protection of old salts. It wasn’t just a regular piracy, it was an intellectual, spiritual, gospel driven piracy, the most noble, gentlemanlike piracy. This is a piracy which is still needed even two thousand years on, desperately needed on our noodle-shaped island and along the Hudson Bay shores. People still need to hear and experience feeding of multitudes, gaining liberation and healing from political and financial oppression, liberation from evil spirits of selfishness, greed, negativity, vindictiveness, etc. We still need to bond against the powers of destruction in the name of divine grace. On Sunday mornings in bible classes and in worship we continue in this subversive quest for justice, peace and healing. A Quiz Question: In a sermon and in several bible classes I have mentioned tangentially that fish from the Lake of Galilee were processed in coastal towns on an industrial scale. What was the major product and export article of this Galilean fish industry? You can give me any ancient name of this article or even only its description. Please send me answers to astehlik@rutgerschurch.org . 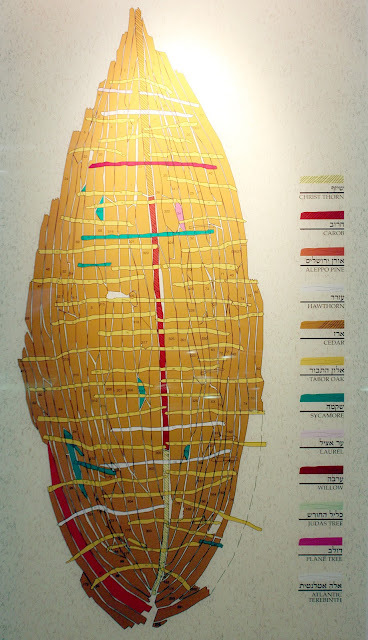 A chart of the different kinds of wood used in this ancient boat. The boat was clearly repaired several times and at times with a reclaimed wood. This further underlines reality of a financially depressed fishermen. 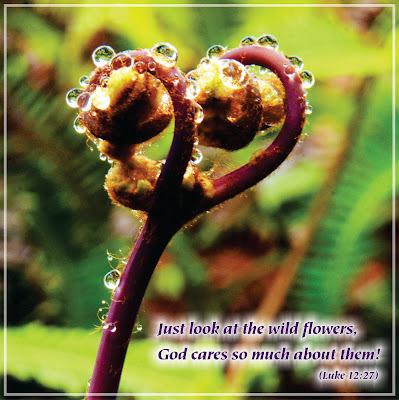 This article was published in Renewal - Rutgers Presbyterian Church Newsletter in Spring 2010. Did the biblical evangelist or early followers censor Jesus or misrepresent him? It certainly might look like it, when you consider the great number of gospels and their fragments which never made it into the Bible. Some of them are as old as the Biblical writings and many of them containing almost certainly authentic stories about Jesus or his pronouncements and his teaching. For instance one of the oldest surviving Biblical manuscripts which is now kept (and treasured) in the Cambridge University Library (Codex Bezae) mentions a story unrecorded by any other biblical version or manuscript: Jesus noticed someone who was working on the Sabbath day, and he said to him: Man! If you know what you are doing, you are blessed. But if you don’t know, you are damned and a transgressor of the Law. In our Bibles this story belongs between Luke 6:4 and 6:5. There are a great number of similar and even more enigmatic and surprising sayings which never made it into the official Bible and we will be talking about them this Sunday. So, was Jesus censored or misrepresented by his early followers and evangelists? This question itself is an example of anachronistic misunderstanding. Such a notion would come only later with the appetite for control from the power-obsessed Church, an attitude which has been perfected by the bible thumping American fundamentalists. Evangelists were writing what they thought important for spiritual orientation, but it never crossed their minds that it was the ultimate spiritual authoritative text. In the evangelist John’s own words (The original closing colophon: Of course, I didn’t record in this book all remarkable things which Jesus did. But what I have recorded I recorded so that you may be convinced that Jesus is the Chosen One/Messiah, the Son of God, and if you put your trust in him, you will have fulness of life. John 20:30ff) he did not attempt to give an exhaustive account of Jesus’ life and teaching. Gospels were meant to be invitations, open doors to Christian faith and Christian life. Like so many important aspects of life, Christian faith does not have any ultimate textbook or manual; it cannot be learned and fully understood from any books. Thankfully faith is to be lived in a community and all (including YOU) are invited and welcomed into this shared quest for the fullness of life. 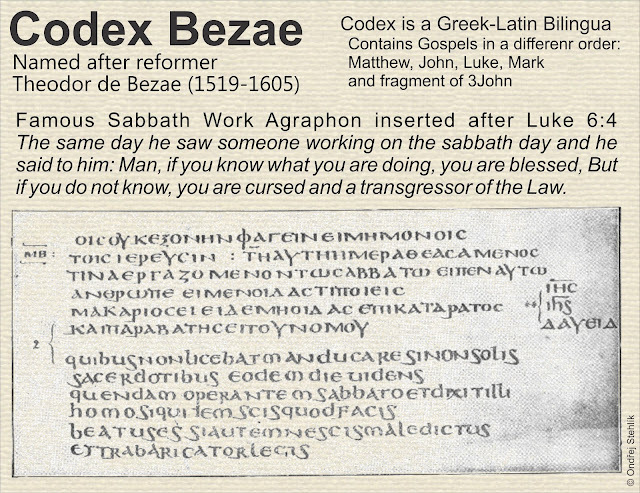 Facsimile from the Codex Bezae of the insertion of the Sabbath Work Agraphon, first in Greek and below in Latin. Context places this insertion clearly after Luke 6:4 and not after 6:5 as many sources indicate.